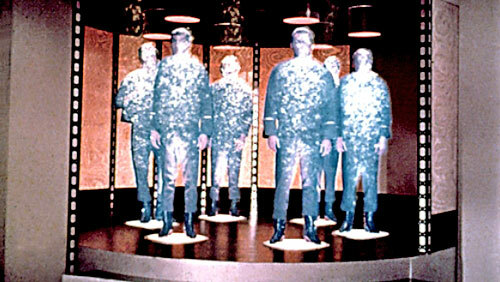 Crew members on the Starship Enterprise beamed to alien planets via teleporters. Now scientists are perfecting a way to communicate via a similar technology. A strange discovery by quantum physicists at the University of California Santa Barbara means that an object you can see in front of you may exist simultaneously in a parallel universe - a multi-state condition that has scientists theorizing that teleportation or even time travel may be much more than just the plaything of science fiction writers. Until this year, all human-made objects have moved according to the laws of classical mechanics, the rules governing ordinary objects. Toss a ball in the air and it falls back to Earth. Drop a coin from your roof and it falls into your yard. But back in March, a group of researchers designed a gadget that moves in ways that can only be described by quantum mechanics - the set of rules that governs the behavior of tiny things like molecules, atoms, and subatomic particles. And the implication - that teleportation and even time travel may someday, somehow be a reality - is so groundbreaking that Science magazine has labeled it the most significant scientific advance of 2010. First, they cooled the paddle until it reached its "ground state," or the lowest energy state permitted by the laws of quantum mechanics (a goal long-sought by physicists). Then they raised the widget's energy by a single quantum to produce a purely quantum-mechanical state of motion. They even managed to put the gadget in both states at once, so that it literally vibrated a little and a lot at the same time - a bizarre phenomenon allowed by the weird rules of quantum mechanics. "When you observe something in one state, one theory is it split the universe into two parts," Cleland told FoxNews.com at the time, trying to explain how there can be multiple universes and we can see only one of them. Crazy? Maybe. Insanely great science? Absolutely. Science magazine has just recognized this first quantum machine as the 2010 Breakthrough of the Year. The magazine's editors have also compiled nine other important scientific accomplishments from this past year into a top ten list, appearing in a special feature in the journal's current issue. "On a conceptual level that's cool because it extends quantum mechanics into a whole new realm," said Adrian Cho, a news writer for Science. "On a practical level, it opens up a variety of possibilities ranging from new experiments that meld quantum control over light, electrical currents and motion to, perhaps someday, tests of the bounds of quantum mechanics and our sense of reality." Science's list of the nine other groundbreaking achievements from 2010 follows. In a defining moment for biology and biotechnology, researchers built a synthetic genome and used it to transform the identity of a bacterium. The genome replaced the bacterium's DNA so that it produced a new set of proteins - an achievement that prompted a Congressional hearing on synthetic biology. In the future, researchers envision synthetic genomes that are custom-built to generate biofuels, pharmaceuticals or other useful chemicals. Researchers sequenced the Neanderthal genome from the bones of three female Neanderthals who lived in Croatia sometime between 38,000 and 44,000 years ago. New methods of sequencing degraded fragments of DNA allowed scientists to make the first direct comparisons between the modern human genome and that of our Neanderthal ancestors. By sequencing just the exons of a genome, or the tiny portion that actually codes for proteins, researchers who study rare inherited diseases caused by a single, flawed gene were able to identify specific mutations underlying at least a dozen diseases. Simulating the gyrations that proteins make as they fold has been a combinatorial nightmare. Now, researchers have harnessed the power of one of the world's most powerful computers to track the motions of atoms in a small, folding protein for a length of time 100 times longer than any previous efforts. To describe what they see in the lab, physicists cook up theories based on equations. Those equations can be fiendishly hard to solve. This year, though, researchers found a short-cut by making quantum simulators - artificial crystals in which spots of laser light play the role of ions and atoms trapped in the light stand in for electrons. The devices provide quick answers to theoretical problems in condensed matter physics and they might eventually help solve mysteries such as superconductivity. Faster and cheaper sequencing technologies are enabling very large-scale studies of both ancient and modern DNA. The 1,000 Genomes Project, for example, has already identified much of the genome variation that makes us uniquely human - and other projects in the works are set to reveal much more of the genome's function. Reprogramming cells - turning back their developmental clocks to make them behave like unspecialized "stem cells" in an embryo - has become a standard lab technique for studying diseases and development. Mice rule the world of laboratory animals, but for many purposes researchers would rather use rats. Rats are easier to work with and anatomically more similar to human beings; their big drawback is that methods used to make "knockout mice" - animals tailored for research by having specific genes precisely disabled - don't work for rats. A flurry of research this year, however, promises to bring "knockout rats" to labs in a big way.